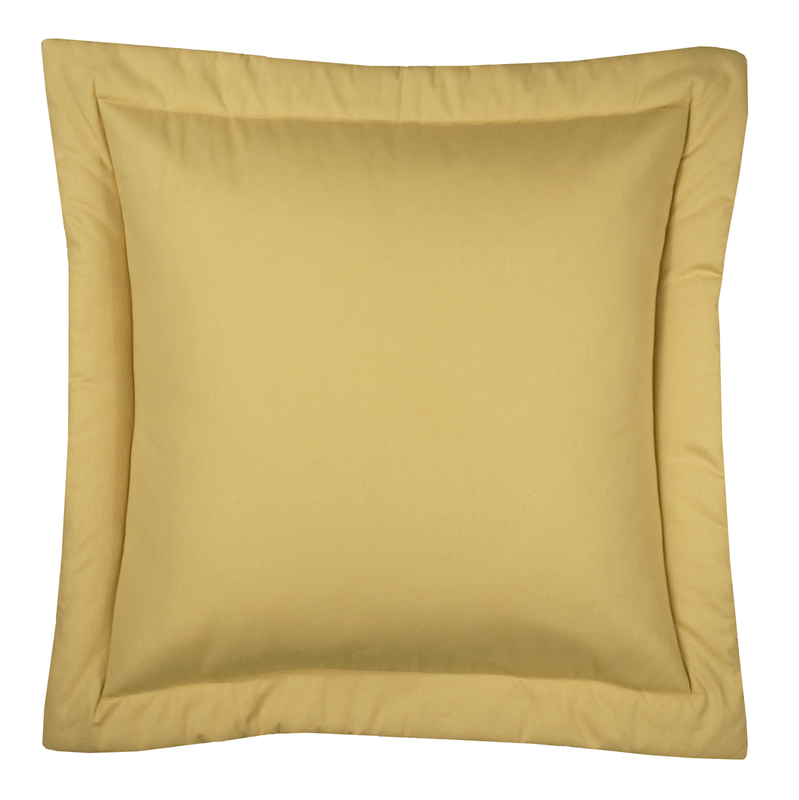 The Captive Pillow Shams is offered in two sizes. Standard Size, used on twin, full and queen size beds, measure 20" x 26" not including the 2" flanged edge. The King size, used on King and Cal King Beds, measure 20" x 36" not including the 2" flanged sides. Fully lined in white lining material, 8 Antique Brass grommets (1-9/16" inside diameter) per panel. Sold in pairs, each panel measures 50 inches wide and 84 inches long. 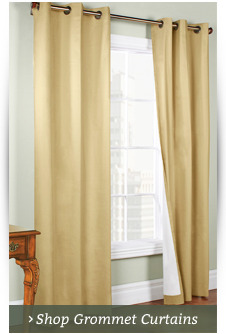 For proper fullness, allow one and one half times the curtain rod width. 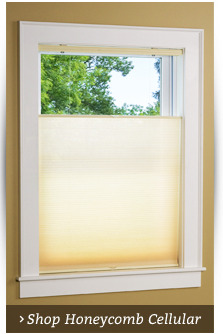 Multiple pairs can be used to accommodate wider windows. Fabric is Cotton and is made in the USA. 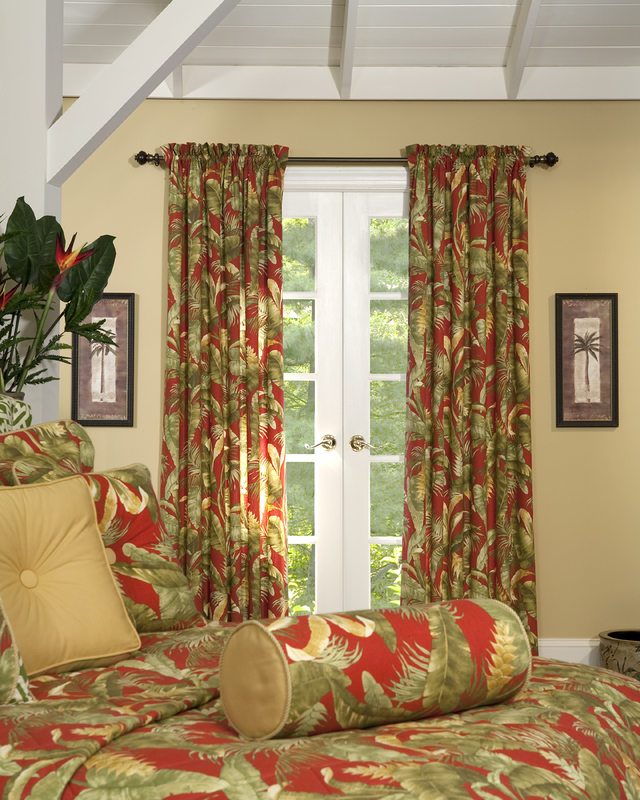 Use a 1-3/8 inch diameter or smaller decorative rod for hanging. 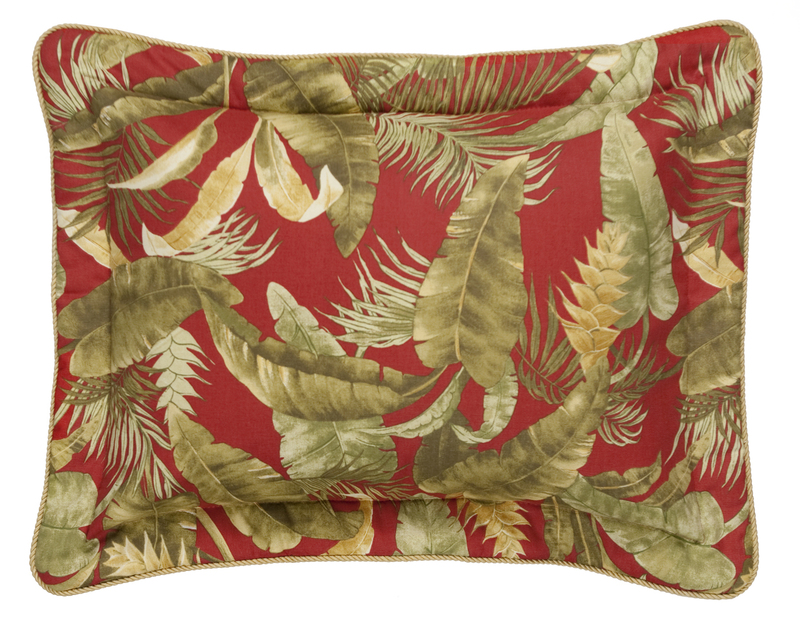 The Captiva two piece Empress Swag, with its a tropical allure, features green tones and gold on a deep red ground. It has a scalloped bottom edge adorned with twisted braid and is fully lined, with a 3 inch rod pocket and two inch header. Allow two times your rod width for proper fullness. 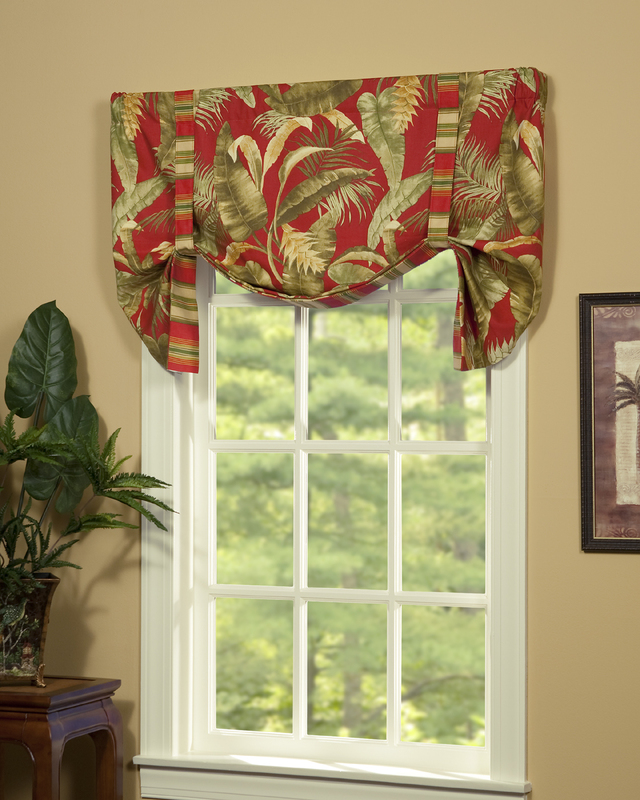 Use the Empress Filler Valances to accommodate wider windows. The Filler Valance fit perfectly between the two swag sides. Use a 2 1/2 inch continental rod for hanging. 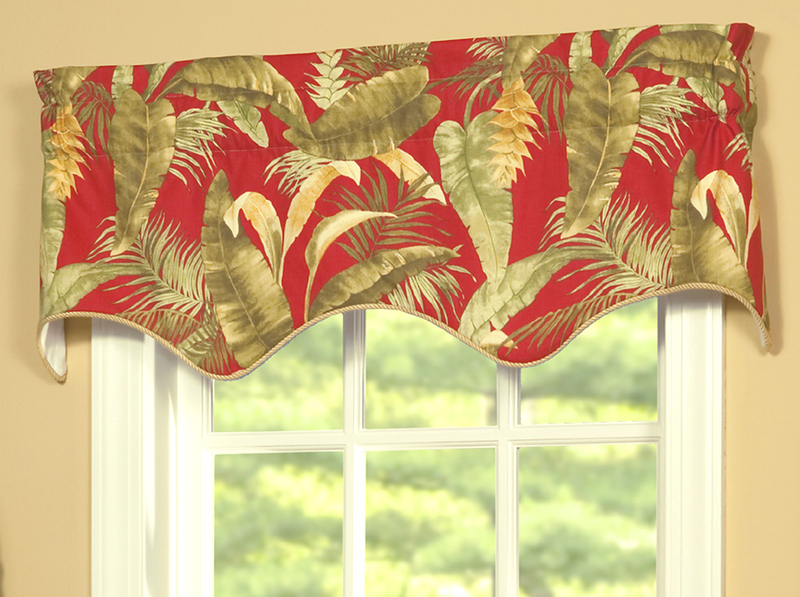 The Captiva Tailored Valance, with its a tropical allure, features green tones and gold on a deep red ground. It's made of cotton duck fabric, is fully lined, has a 3 inch rod pocket, and 2 inch header. The coordinating band along the bottom edge matches the Captiva by Thomasville Comforter Set ensemble and decorative pillows. It's made to gather on the curtain rod. Allow at least two times the width of your rod for proper fullness. 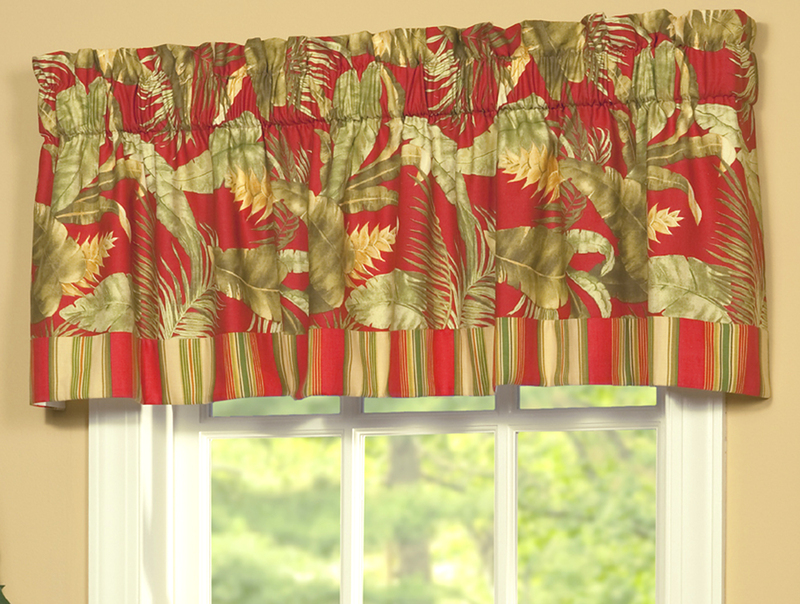 Use either a decorative rod or a 2-1/2 inch continental for hanging. 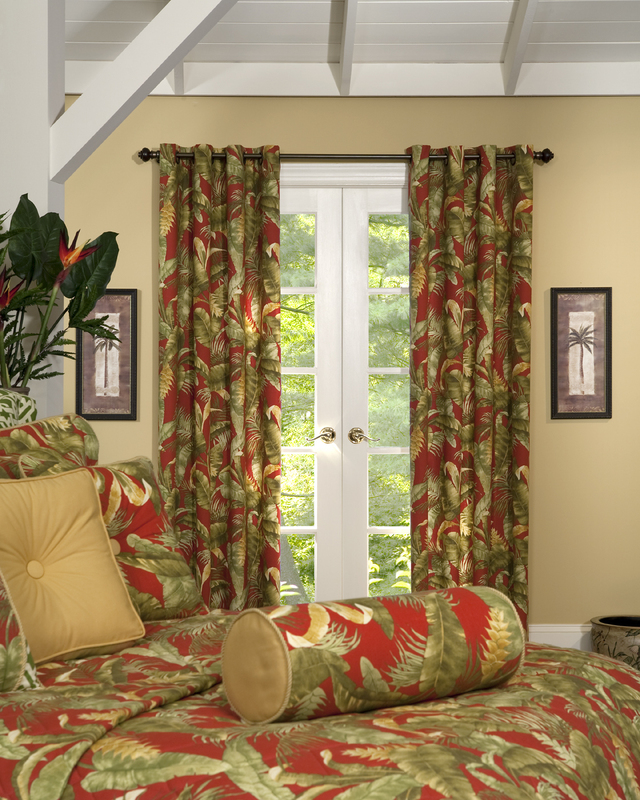 Multiples work well together to accommodate wider windows. 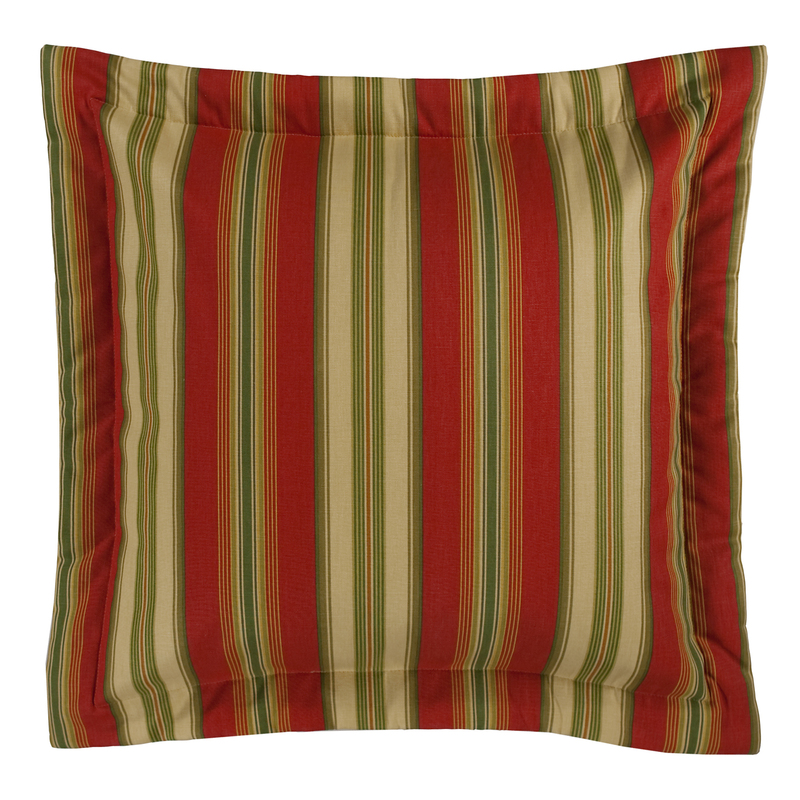 The Captive Square Pillow measures 16" wide and 16" long and is detailed with a covered button in center and twisted braid cording around the edges. 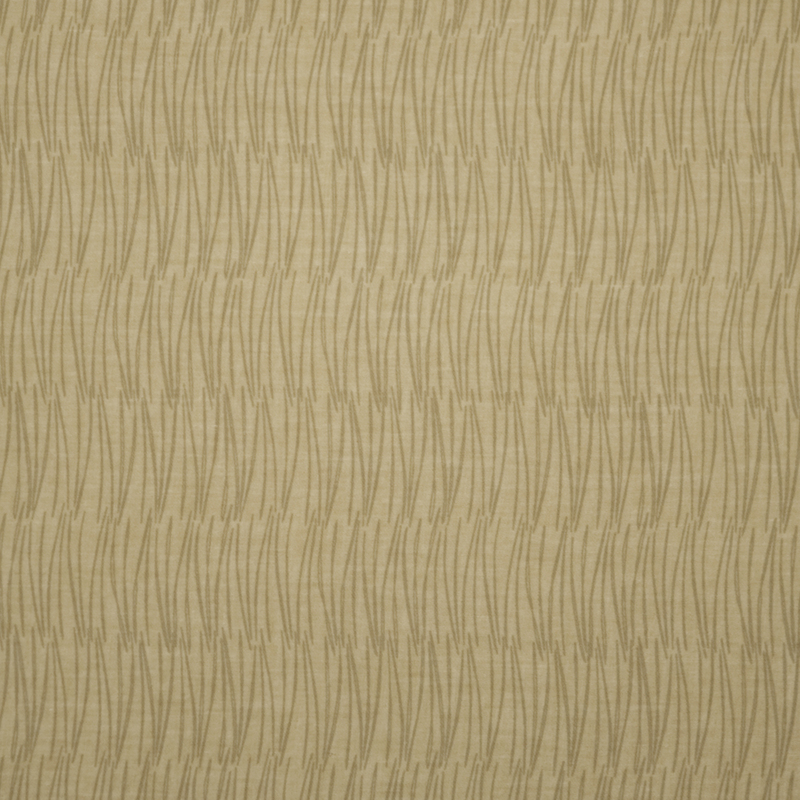 The Captiva Jumbo Neckroll measures 8 inches wide and 22 inches long. Twisted braid cording is applied to the edges. 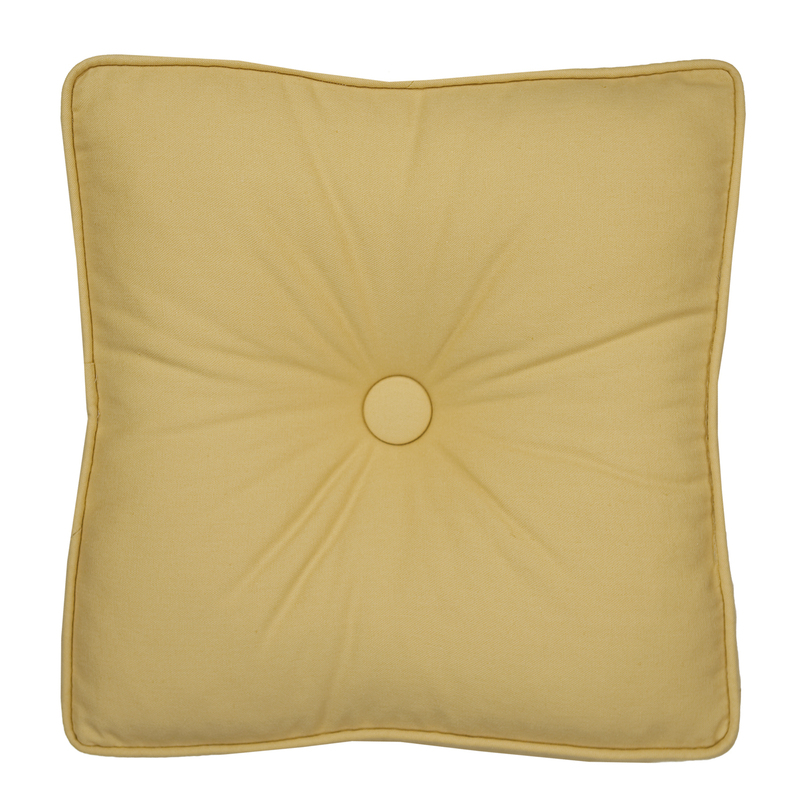 This Golden Sunrise Decorative Pillow measures 17 inches by 17 inches square with a 3 inch thickness. 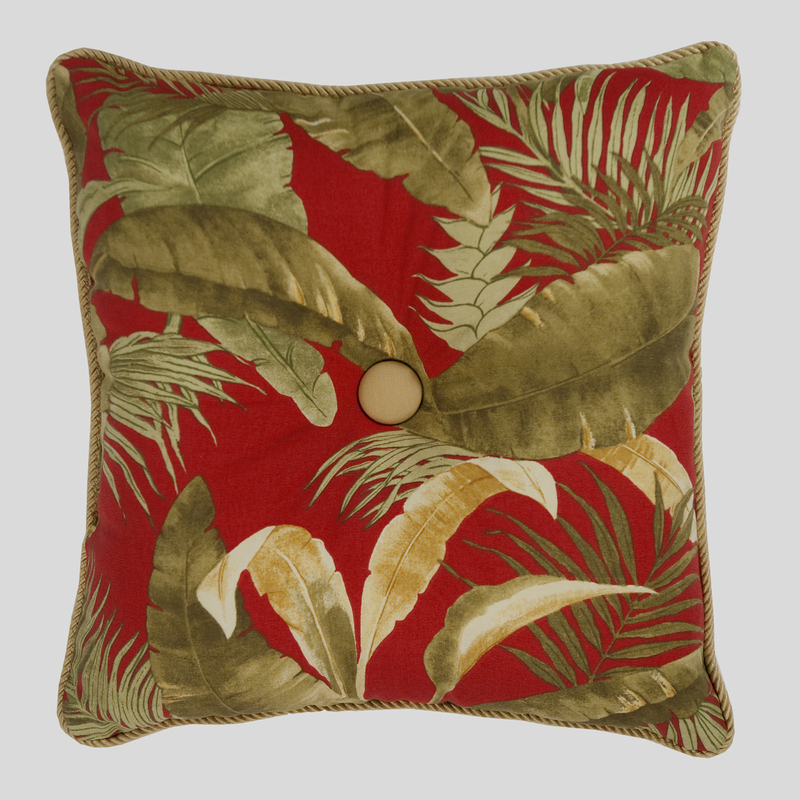 The pillow is finished with a covered button and self piping around the edges. 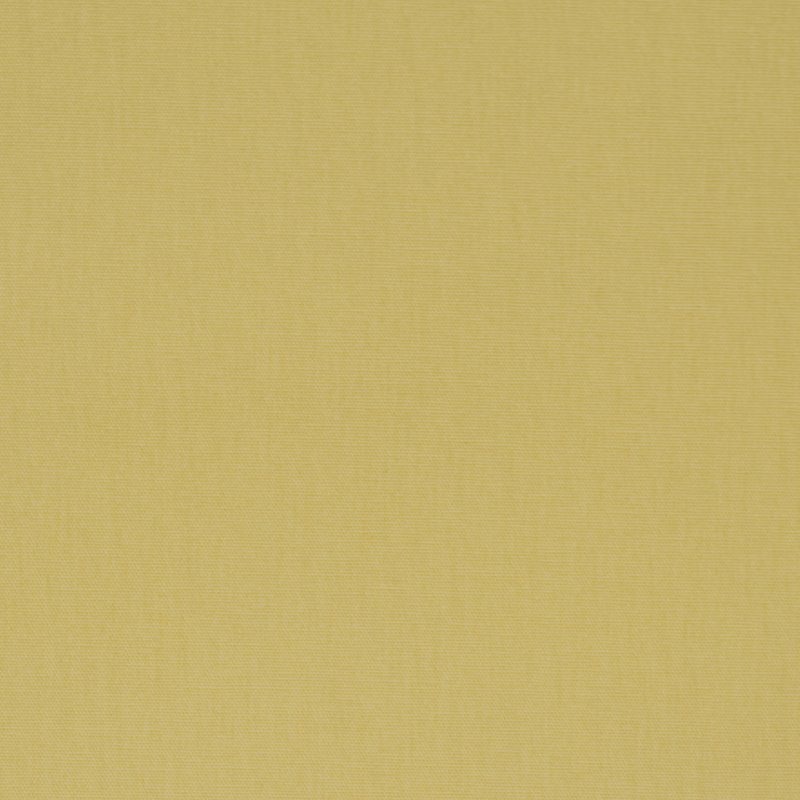 The Captiva Euro Sham measure 26" x 26" not including the 2" flanged edge. Dimensions: 26" x 26" not including the 2" flanged edge. 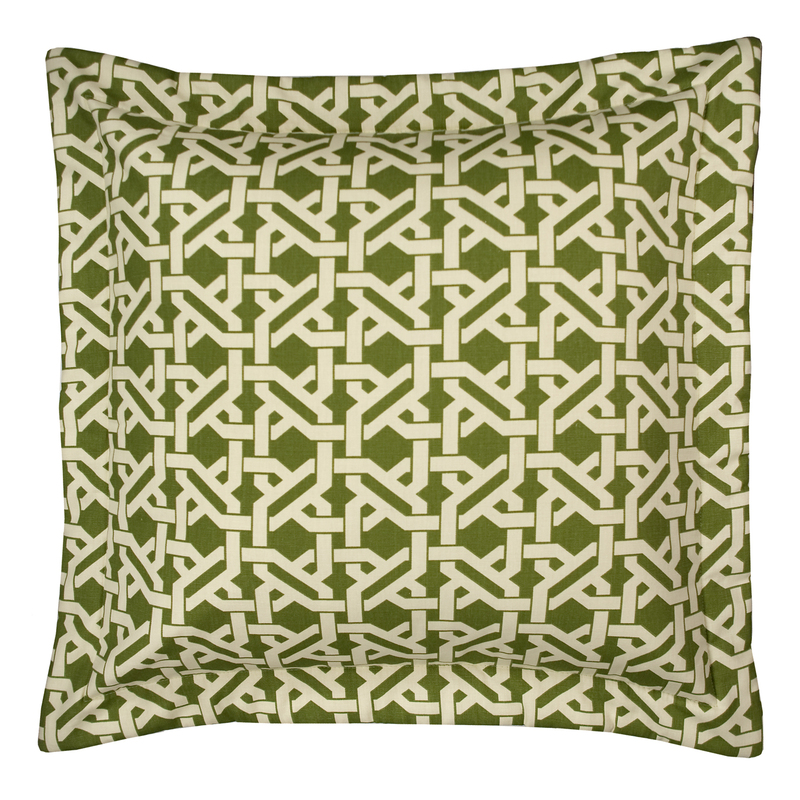 Pillow covering is Cotton and is made in the USA. Dimensions: 26" x 26" not including the 2" flanged edge. Fabric is cotton and is made in the USA. 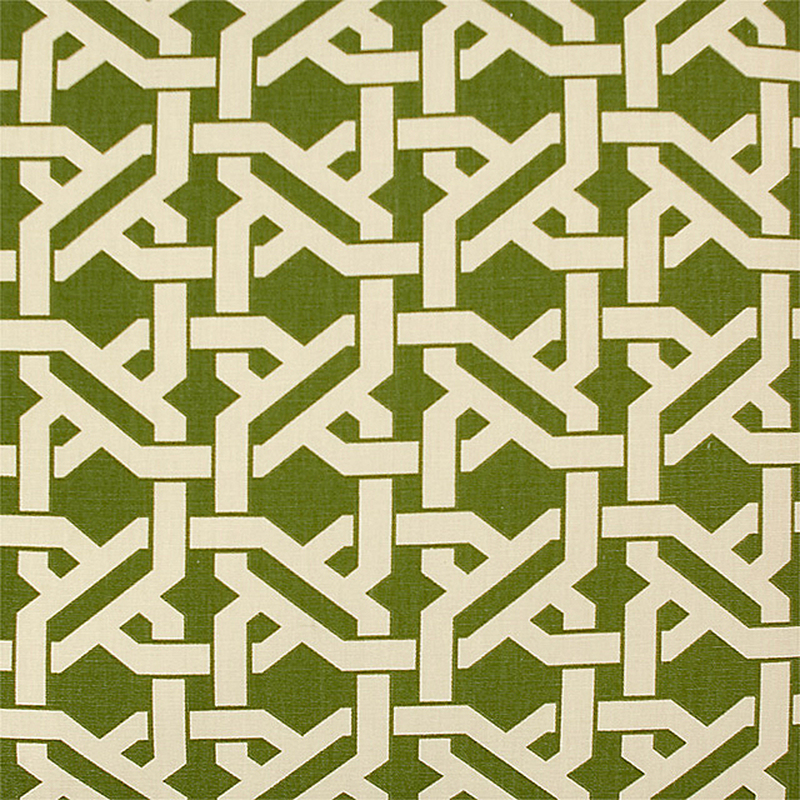 Captiva main fabric is 54 inches wide and sold by the yard. Made of cotton. Fabric is 54" wide and sold by the yard. Fabric is a poly/cotton blend. 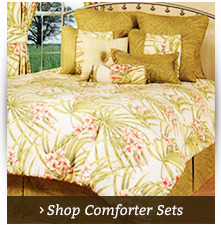 Shop the full Captiva Comforter Set by Thomasville from The Curtain Shop to turn your bedroom into a tropical oasis. 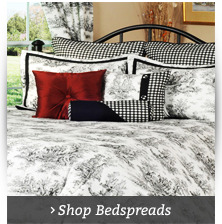 Opt for the entire comforter set that includes a comforter, bed skirt and pillow shams. Sets are available in Twin, Full, Queen, King or California King sizes. If the whole ensemble isn't for you, choose each piece separately. 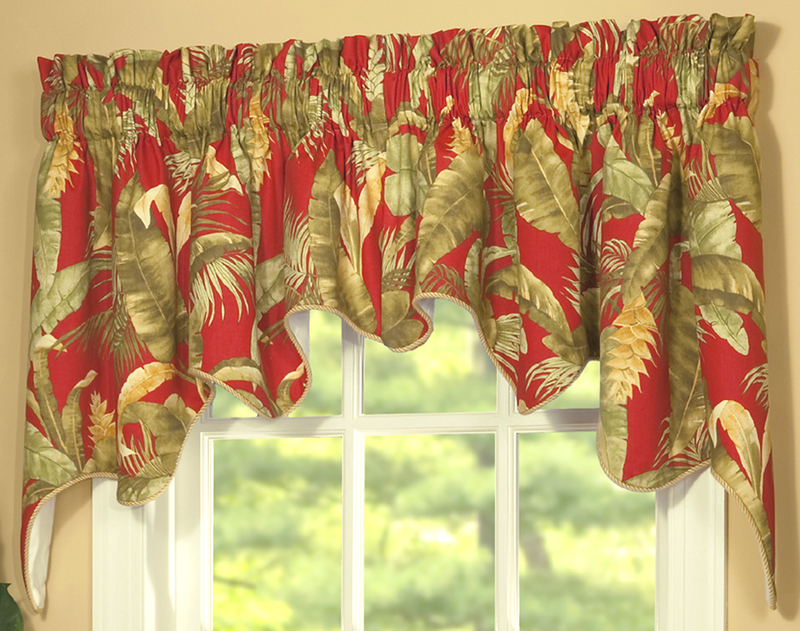 Easily complete your entire decorating project with matching curtains, valances, shower curtains or even fabric by the yard. 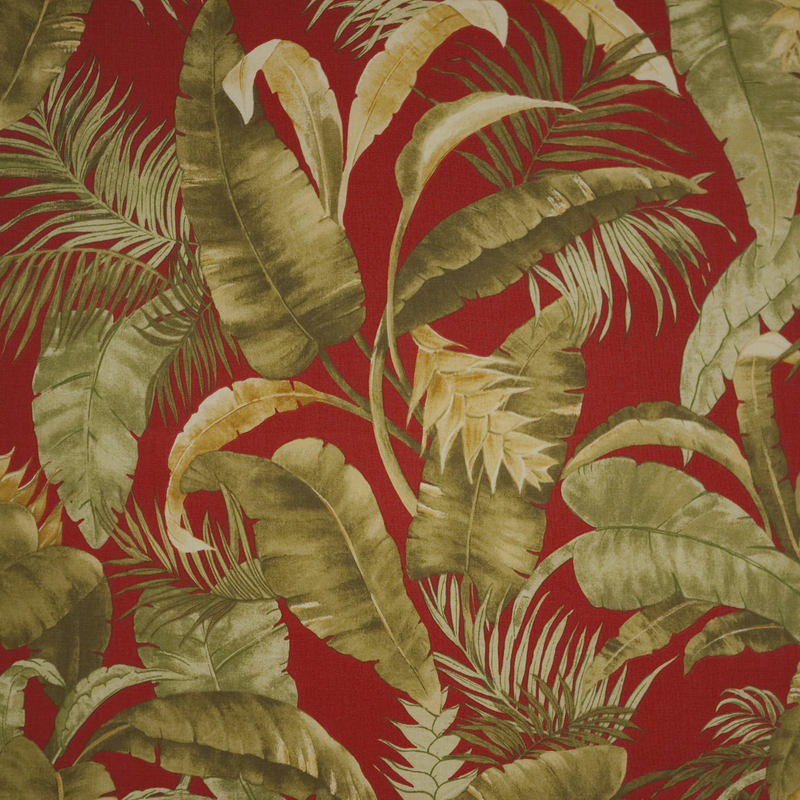 The main Thomasville Captiva fabric pattern features a lovely deep red background with a tropical leaf pattern in shades of green, gold and light brown. 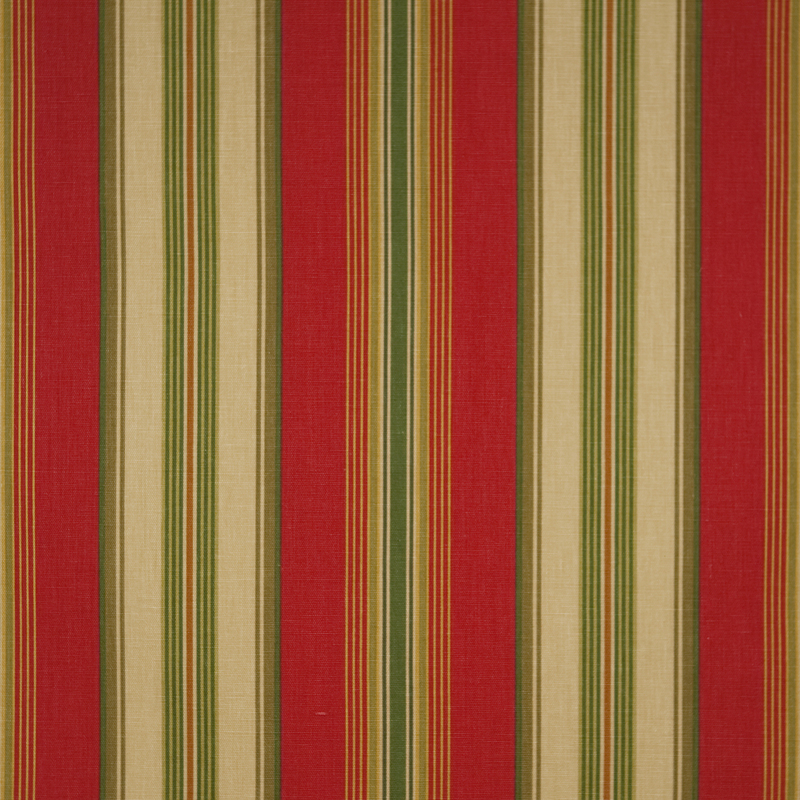 The coordinating fabrics include a green and ivory geometric pattern, stripes in red, gold and green and solid colors in Golden Sunrise and Grass. Each fabric is specially designed to coordinate perfectly to give your bedroom a new depth of pattern and color. 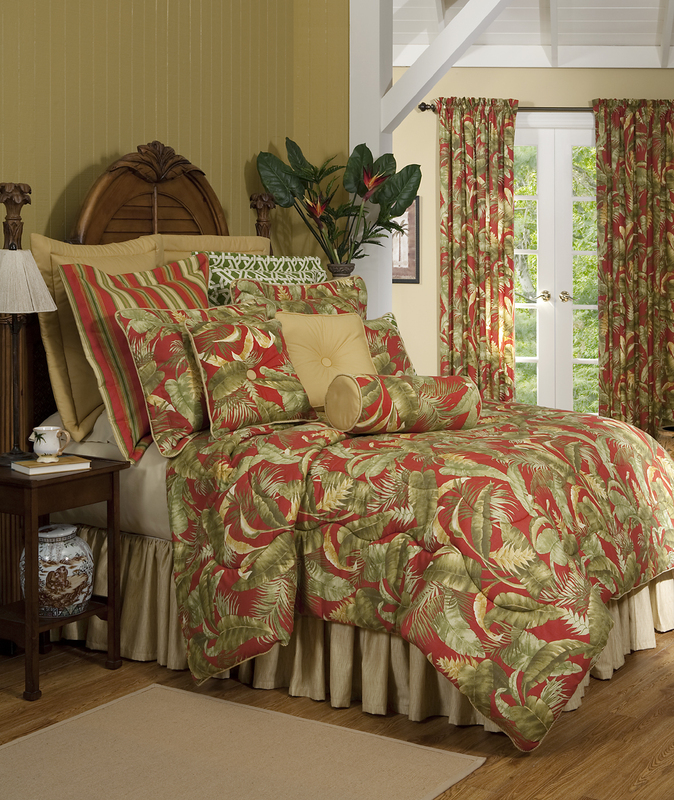 Home décor has never been easier with Thomasville comforter sets from The Curtain Shop.